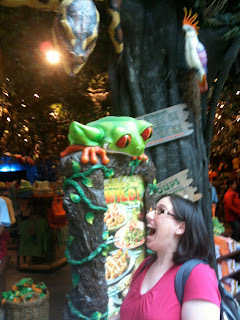 For my husband's birthday this year we had lunch at the Rainforest Cafe. Some of you may know it. It's a themed out restaurant based on (you guessed it) the Rainforest. You know you are in a certain stage of your life when your birthday lunch choice is really more of a treat for your kids than you. We actually did go out for a nice dinner sans kids the week after for our anniversary. As expected the kids loved all the animatronics and the 'storms' that happened every half hour. The price of the food was incredibly marked up (you are paying for the entertainment value of the restaurant!) On the menu that we didn't order, but saw many of was their signature dessert, the Volcano. This $15 baby (yes $15 for dessert) was always brought our by the servers announcing "Vooolllllcaaaannnnoooo" throughout the restaurant. Talk about showing off. Who was the special person that got such a treatment? And they really were flying out of the kitchen that particular day. We opted not to order a volcano. In my mind I did think that it looked easy enough to make...hmmmm. 1 box brownie mix - follow box directions to make brownies, or make your own from scratch - let cool. On a large plate, scoop up lots of vanilla ice cream into the centre of the plate. Slice your brownies length-wise and form a pyramid over the ice cream. 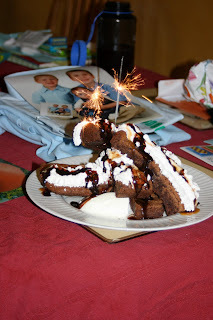 Spray whipped cream 'lava' down each of the brownie sides. Drizzle more 'lava' in the form of chocolate and caramel sauce (heated if possible). Stick a sparkler in the top, light it and call out "Vooooolllllccaaaannnnoooo!" as you carry it out to the guest of honour. Bring lots of forks, this is a lot of dessert, a must share (and then plenty left over). BTW - my oldest boy thought this was fabulous and loved making it for his dad. My DH thought it was ingenious. *I don't know why it looks like there were 2 sparklers in the picture above, there really was just one. This is me being goofy just outside the Rainforest Cafe. I'm supposed to be looking scared of the big snake in the tree, but it looks like I'm being scared of the silly frog instead. Hubby has a surprise 50th next month, and I am making the cakes- I know what am I thinking, well maybe I should go talk to a baker friend today, lol! I was wondering about your photo as I can't really see the snack. I've not been to that restaurant by my kiddos have. I'm gonna try making "the volcanoooooooo" at home for them. What a fun restaurant! I think your version of the dessert sounds amazing. Happy birthday to your hubby and happy anniversary to you both! Great job on recreating the vollcanoooo!